Deciding when the time is right to replace running trainers is a dilemma that all athletes and runners face. They may have been the shoes you completed your first virtual challenge in, or they may have been the footwear you wore when you ran your fastest 10-mile, so saying goodbye to your sentimental companions can be one of the hardest decisions a runner has to make. However, for the benefit of your health and your performance, it’s vital that you update your running trainers when necessary. Continuing to run in trainers that have seen their best days will put you at an increased risk of injury, and will have a negative impact on your performance. So, what are the signs to look out for when deciding if it’s time to swap your trusted and tired trainers, for a new, fresher pair? How often you should replace your running trainers will depend on a variety of factors, such as the quality of the shoe, your running style and your body weight (lighter runners are likely to get more miles out of their shoe than heavy runners), but a good rule of thumb is to upgrade your running shoes every 300 – 400 miles. Inevitably, as your trainers cover more miles, their condition will gradually worsen. A good idea is use an app, like Strava, to track exactly how far you run. It’ll give you an accurate insight into how many miles your trainers have covered, helping you to determine when the appropriate time to update them is. The surface on which you run will also have an impact on how often you should be looking to get a new pair of running trainers. If you frequently run on rough roads or uneven surfaces, you’ll be required to replace your trainers sooner than those who usually do treadmill running. One tell-tale sign that you need new running shoes is if you’re in extreme discomfort or pain when out running. Muscle fatigue, shin splints and pain in your joints (particularly in your knees) suggest that your shoes have lost their cushioning and need upgrading. A high-quality pair of trainers in healthy condition should leave your body with no lasting pain points. Extreme pain or soreness in areas you hadn’t experienced before often mean your shoes are in desperate need of replacing. However, it’s important to note that not all pain when running is caused by poor quality running shoes – you may have strained or overused a muscle for example. If you have any doubts, make sure you seek advice from a specialist health professional or physiotherapist. One of the most obvious signs of when to replace your running shoes is the condition of the treads and the sole. Wearing down the tread until it is completely smooth is one of the clearest indicators for updating your footwear as running in worn-down treads will put you at an increased risk of injury. 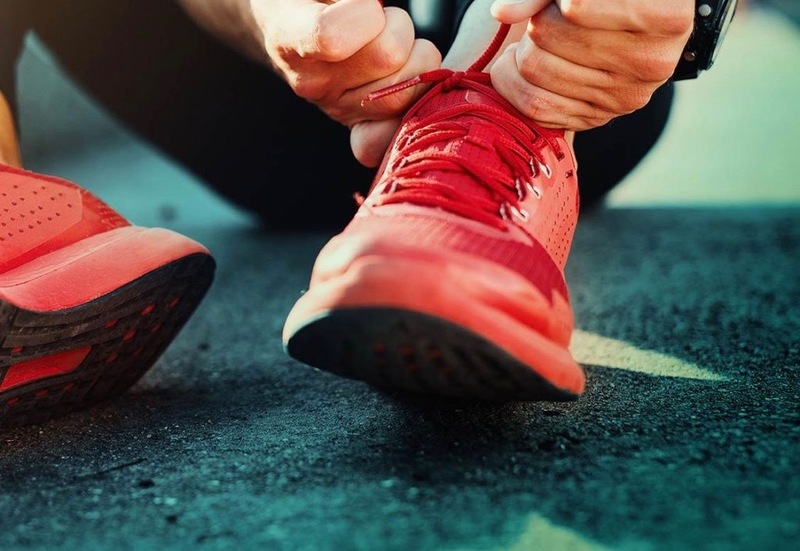 The soles generally last longer than the shoe’s shock absorbency and cushioning, so if the soles are worn down, it’s definitely time to buy a new pair. Another thing to look out for is the springiness that helps cushion footfalls and protect your knees. You might start to notice that your cushioning has worsened whilst running, but if you’re unsure, a good way to test the springiness is by poking and squeezing the sole. If you find it solid rather than springy, it’s likely the material has hardened and is probably in need of replacing. If you’re unsure as to whether or not you require a new pair of running shoes, the best thing to do is to try on a new pair and compare them to the condition of your current pair. If the new ones feel more supportive, comfortable and generally better, it’s time to say goodbye to your old trainers. If you’re looking for a new and exciting running challenge to complete, then look no further than Race at your Pace. We inspire and motivate runners of all ages and abilities to enjoy fitness through our highly popular virtual running challenges! Each month, we run awesome virtual challenges of varying distances that you can take part in. It doesn’t matter if you’re a seasoned athlete, or are only just getting into fitness, we have a distance for you! You have the entire month to cover your chosen distance in however many runs or walks you like, wherever you like, and whenever you like! Once you complete the challenge, you’ll receive a prestigious medal and a slick dry-fit compression top!